Jinx is a 2.5-year-old miniature Australian Shepherd. She came from a rough part of Houston and didn’t live a very great life. The kind people at Hot Mess Pooches took her in and have sent her to us so she can start a wonderful life here. She does well with other dogs, we are unsure of cats and she is learning to trust people. She is shy about being carried or having her neck touched. She needs someone that will make her feel safe and show her leadership. 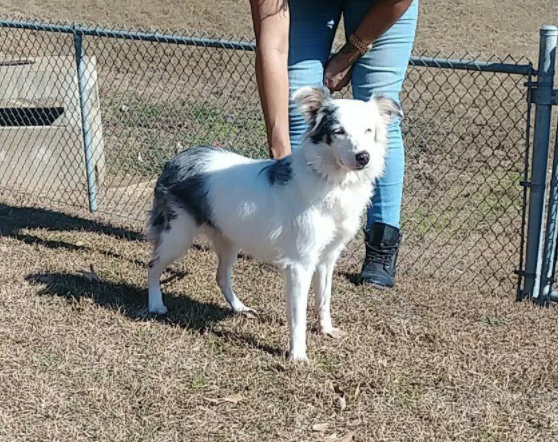 Jinx is a double merle, a result of unethical breeding. Unlike some double merle’s Jinx is in good health with only some minor vision loss in her right eye.